At the beginning of February Chicago got about 16 inches of snow, but instead of climbing over mounds of snow I was in Florida visiting friends. All the way up to when I landed in Florida I was wondering whether I had made the right choice or not. I managed to find a super cheap round trip (because I didn’t realize I had to pay for anything other than a personal item) but it was still a lot of money for me. My flight to Tampa Florida was nice, we arrived early and I had no one sitting around me. One of the stewardesses gave customers the “champagne treatment” which turned out to be her blowing bubbles into the cabin around them. I don’t think I’ve ever had such an entertaining stewardess before. My friend’s apartment was really nice and the area had lots of animals. There were screaming feral cats outside, and ducks that would waddle past except the king duck who stood in the middle of the road and just stared down any cars that dared honk at it. We also went to a Genghis Grill which is a bit like Flat Top where you put together what you want raw and they cook it for you and bring it to you. For breakfast on my birthday one of my friends and I went to the Village Inn. 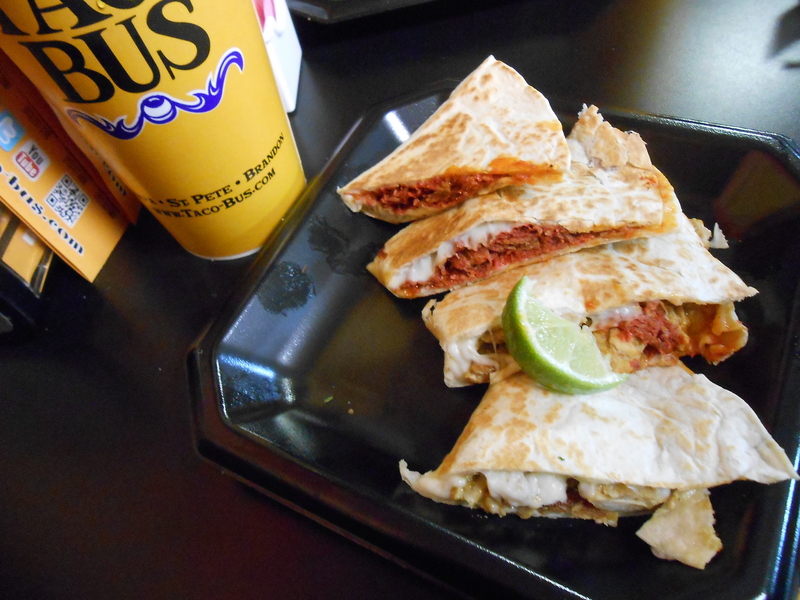 I had been warned that the food wasn’t great but it was cheap and we were eating there because my friend was driving us to Orlando and it was nearby. I was told to check out their V.I.B and was utterly amazed at the amount of food we ended up getting. The V.I.B is an option anytime the Village Inn is open. You pick four items off a selection of about 30 items. The pricing depends on the Village Inn but it isn’t expensive and there’s a good chance you’re going home with leftovers. They don’t encourage sharing but it’s really hard (for me and the friend I went with) to finish that much food. You can choose from eggs, meats, sweet breakfast options, or side breakfast options (i.e. hash browns, fruit, oatmeal, biscuits and gravy). I ordered scrambled eggs, 2 chocolate chip pancakes, applesauce and 2 turkey sausage links. Despite what my friends said, I enjoyed the food. I’m use to eating at quiet diner like restaurants. It was just a lot of food and if we weren’t immediately heading to Orlando afterwards I would have packed up the leftovers to give to the friends I’d been staying with. The friend driving me to Orlando was taking me to hang out where he works for a short period during the day. I had asked, and it was kind of fun to see Disney World through a different perspective, by following someone who works there, with surer steps and with an eye for all the hidden points and history behind the stones and buildings. I’ve been to Disney World before, a couple times, mostly as a kid with my family because it was a place my grandparents really liked. Our first stop was to the guest service desks outside where you can get tickets or ask for help and my friend redeemed one of his free passes for me and got me a birthday pin. I was a bit nervous about wearing a birthday pin because I didn’t really want a lot of random people singing to me, but luckily that didn’t happen. Instead when workers saw the pin they’d just wish me happy birthday and it was a lot more pleasant than I had expected. My friend ended up getting a “I’m celebrating pin”. We spent our day at the Magic Kingdom. 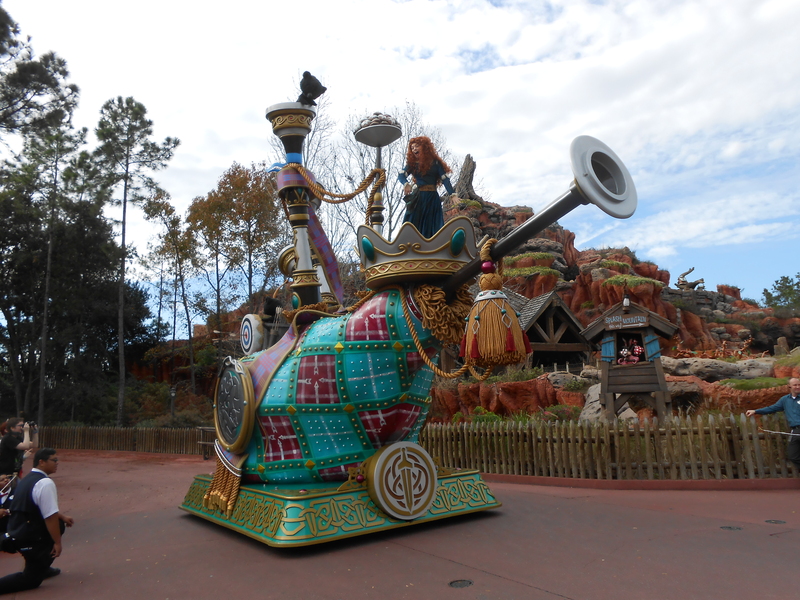 First visited the Storybook Circus in Fantasyland, which has been expanding. The Storybook Circus is a newer part of the park and set up in a Dumbo theme. We rode Dumbo the Flying Elephant which has gotten a new look and past the new interactive section where kids can play while they wait in line; that seems to be a new addition that’s being added to a lot of the lines. We also went on the Barnstormer which is a quick old wooden roller coaster. 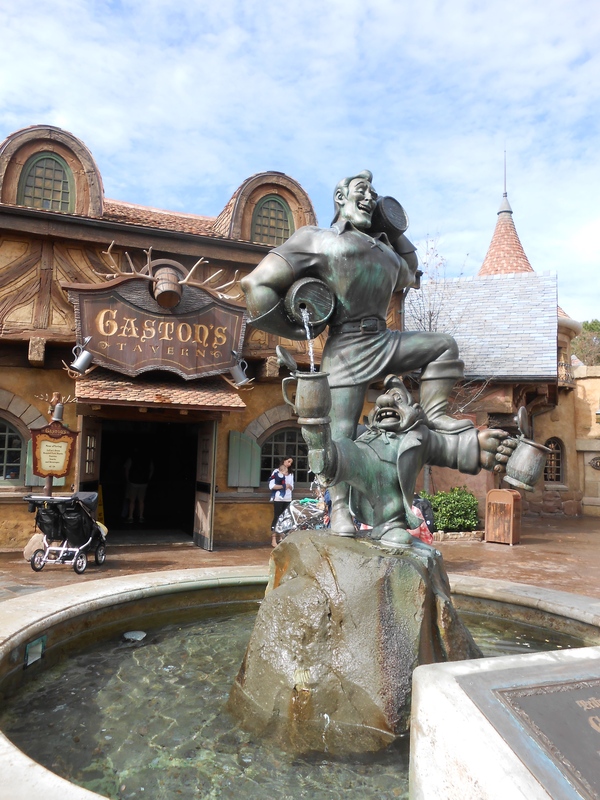 After Storybook Circus we wandered over to The Enchanted Forest for a drink at Gaston’s Tavern. I wasn’t sure what to expect when my friend ordered LeFou’s Brew, but it was really good. 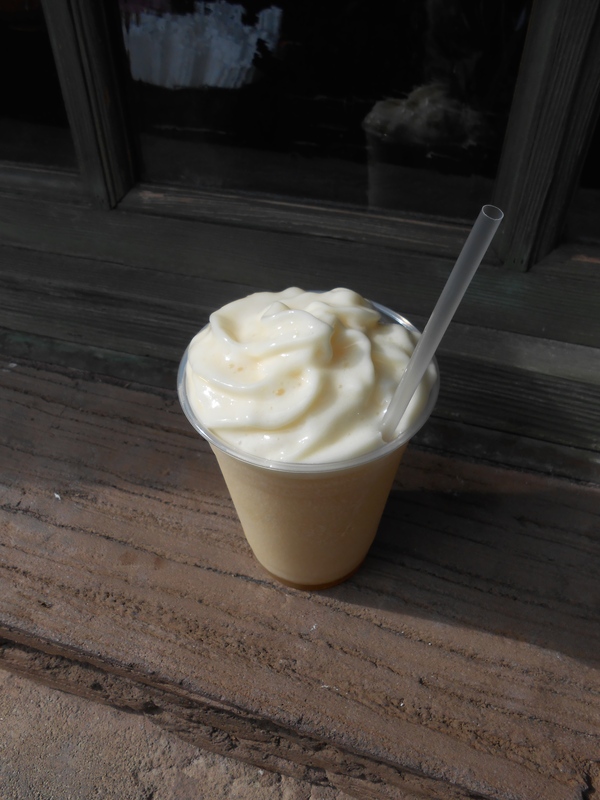 LeFou’s Brew is frozen apple juice, like a slushy with a hint of toasted marshmallow and topped with a passion fruit and mango foam. With LeFou’s brew in hand I followed my friend to a spot to watch the Festival of Fantasy parade, stopping momentarily at a bridge to look for the hidden Pascal’s (the chameleon from Tangled). The Festival of Fantasy parade was a lot of fun, especially since we didn’t really have time to see a lot of a characters in their homelands at the parks. We didn’t get to see all the characters but we saw a lot of them and I really liked the costumes for the extra people who walked in the parade along side the floats. Plus a lot of the floats were well done. My two favorite childhood disney movies/stories are Peter Pan and Alice’s Adventures in Wonderland, and both are in the parade. 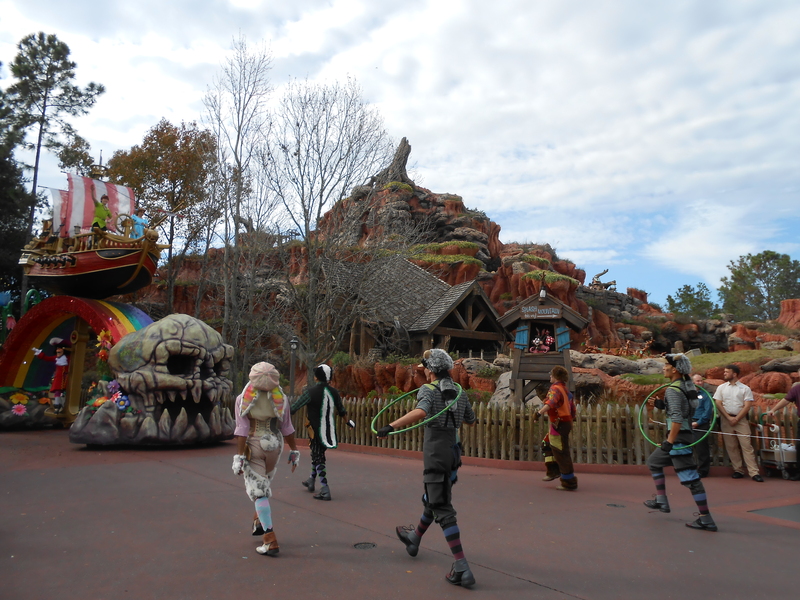 Peter Pan’s float follows the lost boys who don’t march and dance in the parade but instead sort of play around. No matter when I went to Disney as a kid I was never able to find much Peter Pan, Tinkerbell I could always find, but barely ever any of the other characters, definably never any of the lost boys, so it was really cool to see them. 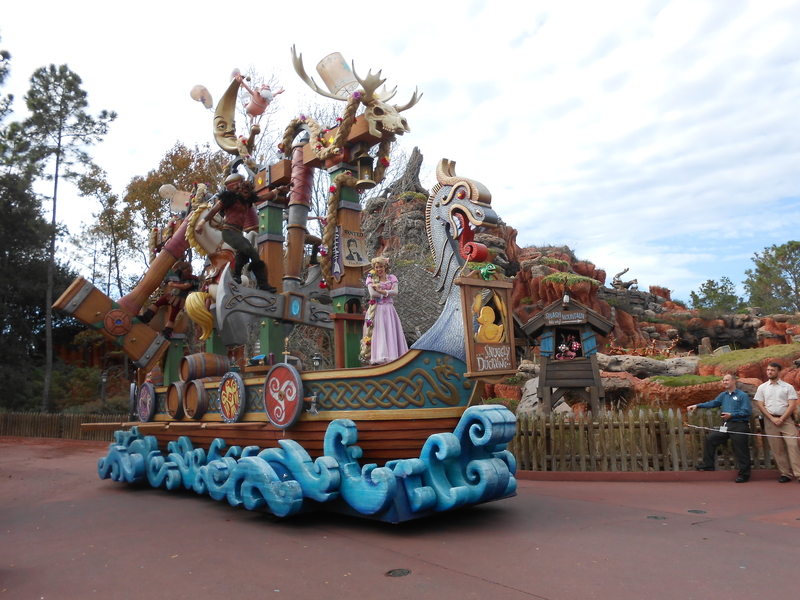 On the back of the float is Tinkerbell in her original form of a pouting sassy fairy and it’s followed by Smee and the ticking crocodile. 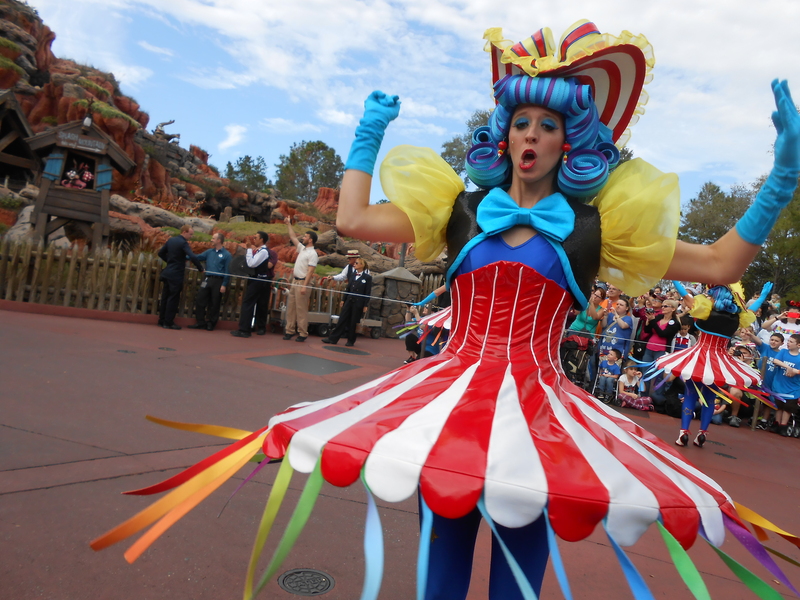 Alice walks in the parade later, dancing and playing with the Mad Hatter and the White Rabbit. They walk with Snow White and some dwarves. 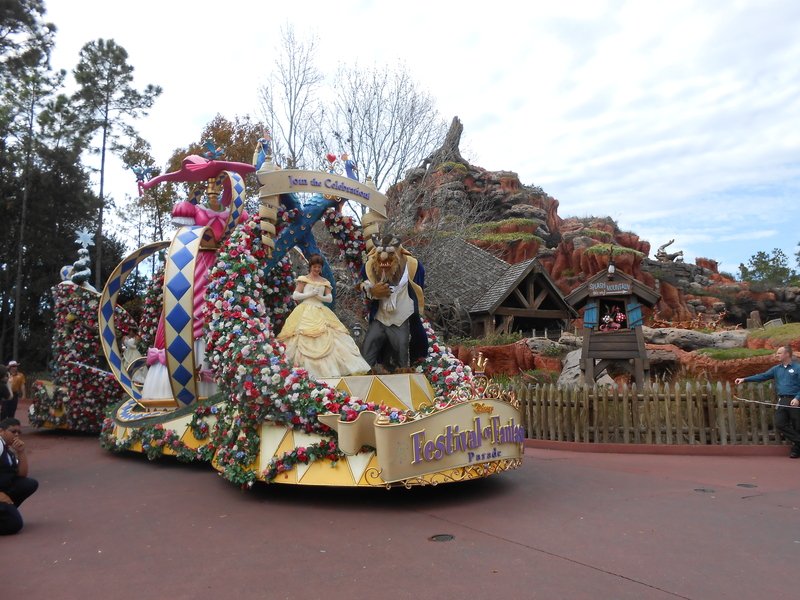 Snow white is the only princess in the parade who walks and doesn’t have a float. 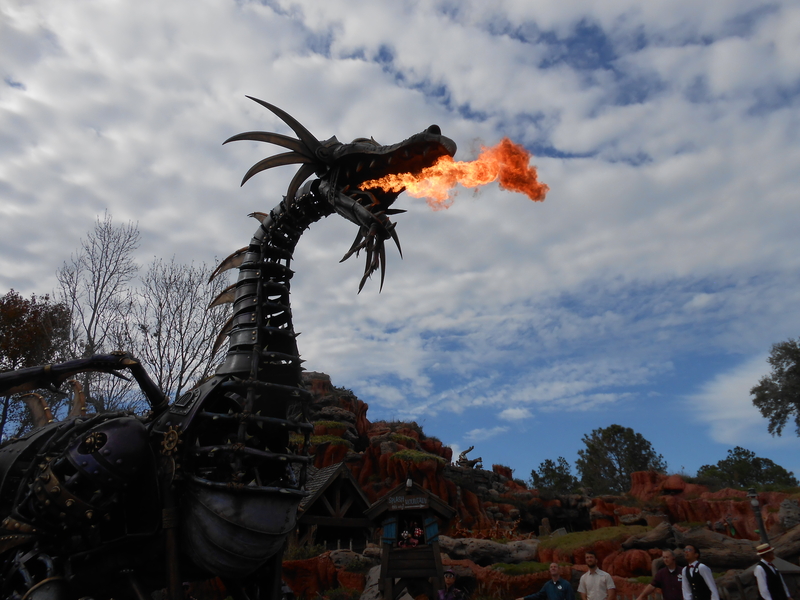 The Festival of Fantasy was a lot of fun and got packed pretty quickly. We watched it near Splash Mountain. After the parade we went and rode the Pirates of the Caribbean ride in Adventureland and then grabbed lunch on Main Street U.S.A at Casey’s Corner. We ordered corn dog nuggets and then dipped them in hot cheese that we got next to the other condiments. Be warned: they can come out super hot. After lunch we went on some of my friends favorite rides in Tomorrowland which were Buzz Lightyear’s Space Ranger Spin: an interactive ride where you shoot at different targets to help out Buzz Lightyear against Zurg. The other ride we went on was Space Mountain which is an indoor roller coaster. I hadn’t been on either before. Both have interactive lines which can both entertain guests and slow down the line. We went on both sides of the Space Mountain ride and my friend warned me that sometimes people loose items that are not secure on one of the drops. After talking to some of my friends coworkers we went to Liberty Square and went on one of my favorite rides, that has been one of my favorite rides after my family coaxed me onto it as a crying child the first time I went to Disney World. The idea of the Haunted Mansion as a kid scared me to death but I was calmed down by one of the workers on the ride and after the ride ended I wanted to go on again. So I try and make sure, no matter how bad the line, that I go every time I’m in Disney World/the Magic Kingdom. The plus of going with my friend was that he knew exactly where to stand to get through to the next section faster, like where the wall opened up and where we’d be led next. We also went back to Fantasyland afterwards to try and get on the new ride Seven Dwarves Mine Train, but right when we got to it the ride had broken down, so we got ice cream and went on Peter Pan’s Flight and then had to leave because we had to meet my other friend halfway between Orlando and Tampa at 7pm. I had a ton of fun, even though we weren’t there for long. It was nice following someone who knew their way around so easily and it was interesting to learn bits of history, what items were apparently hotly desired items on the black market, and which things if they broke were irreparable. We weren’t able to stay for any of the fireworks or any of the fun night events, but it was probably one of the warmest and most enjoyable birthdays I’ve had. Back in Tampa my flight was for the day after my birthday, and I arrived early and found a spot to sit and read. Eventually, probably after an hour or two I looked up and saw that my flight was cancelled and made my way to rebook, call my friend, and wait for my baggage. I waited for my luggage for several hours and found a couple who were just as disgruntled over the cancelation of their flight. Luckily my friend couldn’t get off work until the afternoon so I didn’t have to worry about her waiting with me while my luggage finally got spit out, but I did get a lot of reading done sitting at the airport. We didn’t do too much that surprise last day and just hung out, but it was fun. Despite being worried that I hadn’t made the right decision to go to Florida I ended up having a great time and didn’t regret it after I got there.